I'm sure by now you've heard of the "One Word" idea from oneword365.com. Instead of worrying about resolutions, you come up with one word just for you to focus on for the year. I love the idea! See how it begins with diligence? Much to my dismay, it does not begin with daydreaming on the couch or with checking Facebook for the 20th time just to see if somebody liked a status. 1. Steady application in business of any kind; constant effort to accomplish what is undertaken; exertion of body or mind without unnecessary delay or sloth; due attention; industry; assiduity. 2. Care; heed; heedfulness. Good stuff, this diligence. I'll be praying that the Lord will help me with this one, because my natural tendency is to only be diligent in some things some of the time. Not only is Melanie making buttons, but she's also having a linkup at her blog for anybody with a post about their One Word. I'm linking this post up! She'll have 1 linkup each month so you can share how you're doing with it! Whatever way you choose to get organized or refocus in the new year, I hope you all have a very blessed 2013! Thanks for being a part of my blog! Great post my friend. I did a one word post earlier today. But your post about your word is much better. LOL! Oh and we love that dictionary too. Big I'm very diligent at commenting on your blog over the past few years size hugs to you. Great word! 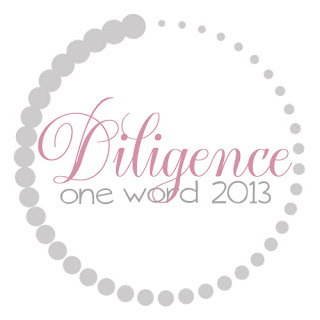 Diligence is something that I need to walk in. May God bless you for your diligence as you walk out this journey.